One of the key diagnostic procedures on a t7 saab is checking the MAF sensor. Maybe you notice it surging on cruise control, too little power/ too great of mileage or the opposite in the worst case it can kill a piston. Many shops will repair the symptom without rectifying the problem! Now the easiest method is with the proper tools. The factory tech2 is quick. But there are some alternative methods that will at least point you in the right direction. We need to look at a few variables. We can see them direct with the tech2. Those variables are Airmass demand per combustion cycle. (The unit is mg/comb) and calculated airmass per combustion. The difference of these two gives us airmass deviation. Some other key adaption data is the fuel trims both long and short term. Now that we know what to look at we have to be able to interpret the info. Since the amount of air in a turbocharged engines induction system is a dynamic situation, storing more airmass under boost than at atmospheric pressure we can only test it in steady state conditions where the fewest variables are changing. 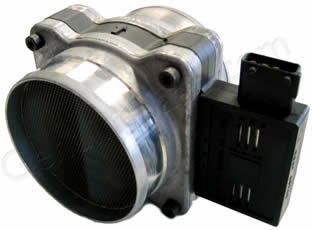 This can be anything from idle to steady acceleration on the road or holding fixed rpm on the chassis dyno. Just make sure you are testing not in transition state. The saab software engineers have made it easy with a dedicated page in the tech2. It is f6: total fuel correction. We can evaluate the fuel trims first. Somewhere around +-5% would be acceptable. Over that and you are looking at a hardware problem. Now for positive fuel trims it is usually an air leak blown booster etc. The airmass deviation which is calculated in the scanner from actual Airmass and calculated airmass. T7 simultaneously calculates airmass off speed density like a t5 car by using pressure and temperature in the manifold. If we look at the deviation with the car warm and idling the data will be steady. More than low single digits will show up with too great of fuel trims. If we drive the car, open road is better. You should, in a good car, see the deviation move around as throttle is added and the pressures (and resulting airmass) change but should settle down It’s not uncommon with a failed maf to see the file trims jumping around in the teens along with deviation. I had some dyno runs where we tried 10 MAFs in my Viggen on the dyno at ~350whp there was a 50HP difference! Eventually trionic would adapt but the difference was the raw output. 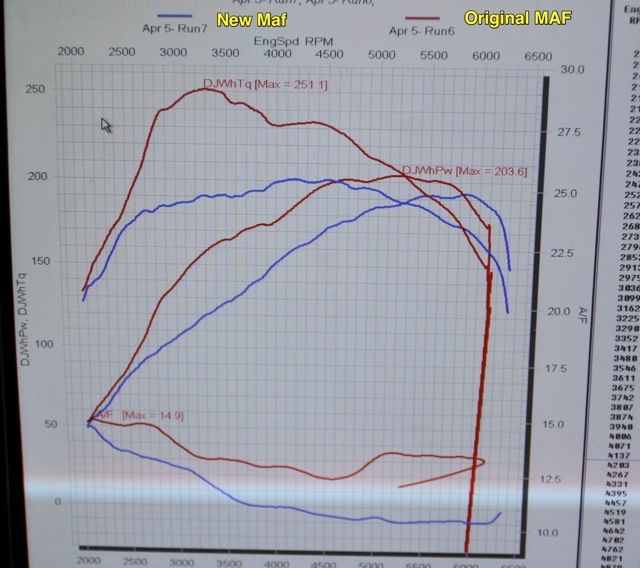 Unfortunately this info was lost when the Tuning/Dyno computer was stolen.. Had recently a 400whp Viggen that had a maf that although looked normal at low loads would hit a cap at 1200MG and not read any higher, swapped maf and it was back to happy. Here is a B205R we did recently. This is the same software 5 min apart with only change being a new maf to replace the skewed one that was reading quite low. Easy to see how they can be that far off and still not throw a code but the motor will suffer. It was quite lean up top since the faulty sensor was reporting too low of airflow leading the ECu to try for more air but fuel for what it “knew” it had. This entry was posted on Wednesday, August 18th, 2010 at 6.22 pm and is filed under HowTo, Powertrain. You can follow any responses to this entry through the RSS 2.0 feed. You can leave a response, or trackback from your own site. Good write up. So in essence what are the peeps that do not have access to a tech2 scanner supposed to do to diagnose this more precisely. Will OPCOM give you access to the MAF readings? Thanks in advance. It is a case of having the right tools and knowledge makes it easy. Without the right tools it is much harder. Not sure never tried the opel tool on a t7 car. If you have those symbols calculated in the tool it should be possible. The generic obd tools do not.